...For a coyote alert. Fine residents of Golden Valley, be on the alert, my husband swears he saw a coyote. In our back yard. This morning at approximately 5:28 we awoke. Jeremy to get ready for an early conference call at work. Kara, to head off to the gym. Jeremy gets out of bed and takes Dog #1, the puppy, out to go potty. Kara lays in bed wondering why it is that humans require exercise, dozing in and out of consciousness. Until she hears the quick and feverish barking of Dog #1. And then the quick and feverish footsteps of her husband. "Oh my gosh, oh my gosh, I just saw a coyote" Jeremy screams, bounding into the bedroom at 5:35AM. "A coyote? Are you nuts?" Kara responds, certain this is all a part of her dream. She's been known to have some strange dreams. "Yes, a coyote, and it came around the corner, and it chased Stan, and he barked, and it ran away, but there's a COYOTE out there." Jeremy screams in a fast and panicked tone as he turns on every light inside and outside of the house. "I need your help Kara. I need you to come out there with me." he explains. "Are you kidding me?" Kara asks. "Let Dog #2 pee inside, we have hardwood floors." Kara responds and climbs further under the covers. After further coaxing, Jeremy convinces Kara to stand outside with Dog #1, the protector dog, as Dog #2 pees, in an attempt to ward off the coyote. If that coyote comes a knockin' I'm certain Stanley Frank (Dog #1) is going to be a force to be reckoned with. All 11 pounds of him. Good thing the Franks have entrusted their lives with an 11 pound puppy. Dog #2 does her business, no sight of said coyote, and Jeremy and Kara bring the dogs inside, and Jeremy insists on calling the police. He calls the police and informs them of the wild Coyote roaming the neighborhood, and tells them to come find it. Now Kara never saw this famed coyote, roaming the yard. 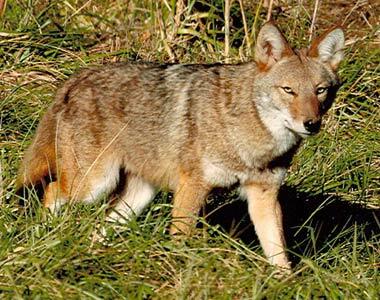 But she has a sneaking suspicion, this wild coyote, may have been a bit more stray Labrador, than wild coyote. But you never know...the coyote could be roaming. The Franks will be safe, thanks to little Stanley Frank and his big attitude. There was a coyote that lived in my parent's backyard for awhile and last summer I was walking Nash with a friend by her house in a nature reserve and was chased by a coyote. We have to be careful with our small dogs. If you start seeing big ACME crates full of TNT in your back yard, don't worry, I hear he never succeeds. I just saw that article too...you're not crazy! The sighting in the article is very close to my house. I think my dog is too big to be thought of as an easy meal though. I just read in the paper that coyotes are on the loose! NOT COOL! As if I'm not a paranoid puppy-mama as it is!